Fairway is a government-funded, not-for-profit 65 bed residential aged care facility operated by Sandringham Aged Care Association Inc (SACA). The history of Fairway is intrinsically connected to the Bayside area. It is a triumph of committed local community members who in the mid-1980s identified a need for high quality aged residential care that captured the spirit of the Bayside community. Fairway was built in 1995 as a 30-bed not-for-profit community home, offering the highest quality clinical care and an innovative commitment to overall resident wellbeing. In 2004, more Bayside residents were able to remain in the community in which they had lived, worked and raised families, with the extension to a 62-bed capacity. A further 3 beds were added in 2017-2018, and services were additionally expanded to include an innovative dementia living program. 2017 – 2018 saw the restructuring of reception and other office areas, construction of 3 new resident rooms, a new hairdressing salon, new commercial laundry and the set-up of a stylish and contemporary café. The building displays innovative and visually striking architecture with vaulted ceilings and highlight windows providing a spacious and airy environment with generous natural light and views to garden and courtyard areas. It is decorated throughout in contemporary colours and style, and, with input from an interior designer, the décor is constantly being renewed and up-dated to keep pace with current trends. A car park on site which includes two disabled spaces has reserved spaces available for visiting family and friends. RNI Prince Henry’s Hospital , Ba APP Sci ( Monash) MHS ( Nsg Course work – Monash) Academic staff ( Monash)PHAV Nurse Managers Cert. Sandy has had an extensive career as, CEO/DON Florence Nightingale Hospital, 18 years, DON at Epworth and Brighton Rehab, Broadmead Uniting Care, Site Manager at Fernhill Aged Care 9 years. She has currently been CEO/DON of Fairway from 2008 until the present. Willsmere Hospital, Registered Nurse, Crisis Assessment Unit – Kingston Centre -2 years, Lifestyle Manager – Southern Cross Homes, Victoria (Developed and implemented dementia specific programs.) Nurse Advisor Department of Health and Human Services – Residential Care Standards Section – 3 years, Project Officer, Policy Development – Community Health Development Unit – 2 years, Accreditation Coordinator, St John of God Hospital, Brighton – 1 Year, Assistant Director of Nursing/Quality Manager, St John of God Hospital – 3 years, Registered Nurse, Fairway – 11 years. Lifestyle Manager (Fernhill) 15 years. Tonianne has been Lifestyle Manager at Fairway Bayside Aged Care for 9 years. 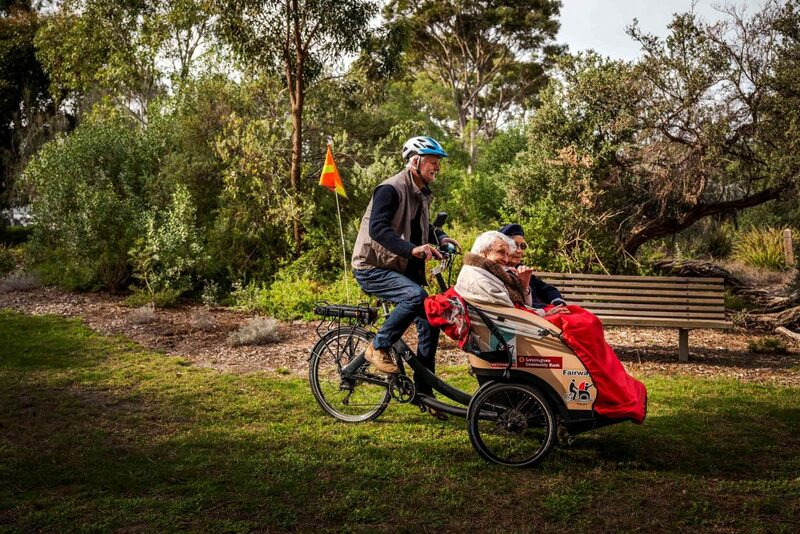 Tonianne was one of the first to understand and embrace “Cycling Without Age”. Fairway was one of the first Chapters in Australia. Tonianne has lived in Beaumaris for 25 years. Bachelor of Nursing (Post Registration) 2003. Bachelor of Psychology 2001. Certificate IV in training & Assessment 2018. Western General Hospital. St John of God Health Services. Registered Nurse. Anaesthetics PACU. Ozcare RACF Queensland. Eleanora RACF RN1 & Acting Clinical care Co-ordinator. Carolyn has been Fairway Clinical Care Co-ordinator since May 2014. Bank of Scotland; British Waterways (England) (Cashier); Santa Cruz Operation (England) (Assistant Accountant); Dunblane Kids Club (Scotland) (Office Manager); Fairway 8 years various roles (Finance Assistant, Quality Coordinator and Business Development Coordinator). Owner/Head Chef – New York Deli Cafe, Armadale – 4 years. Kitchen Manager – Gregory Lodge Nursing Home, Flemington Catering Manager, Fairway – 2016 – current. I am motivated by challenge and dedicated in working to the highest of my ability, demonstrating reliability, honesty and integrity. The role of the Sandringham Aged Care Association (SACA) and the elected Committee of Management. Established in 1992, Sandringham Aged Care Association Inc (SACA), trading as Fairway Bayside Aged Care, is a not-for-profit entity. SACA’s membership reflects the community of friends of Fairway Bayside Aged Care, and is reinvigorated regularly with new supporters from diverse professional backgrounds committed to maintaining this unique facility. The voluntary Committee of Management is elected by members at the Annual General Meeting. This seven-member committee works tirelessly to meet all the legislative requirements, including strategic direction planning to take Fairway into the future. The committee works with the CEO to ensure that Fairway’s values are maintained and strengthened. Michael holds a B.Econ. (Hons) and LLB and has been a commercial lawyer for 35 years. He was Vice President of the Association from November 2015, when he first joined the Committee, until May 2018 and from that time has been President. He has lived in Bayside for over 50 years and is the son of a past resident. Felicity was awarded an OAM and has over ten years experience on a diverse range of boards and statutory authorities, including former mayor and councillor at Bayside City Council. She has tertiary qualifications in both marketing and tourism and currently works as a Business Advisor specialising in developing and implementing Marketing Plans and Strategy. Anthony worked in London for 37 years as a Solicitor of the Supreme Court of England & Wales before migrating to Australia in 2001 and settling in Sandringham. He has been a member of the COM since 2012 and Secretary since 2016. CPA, FCIS, FGIA, FAICD (past). Kevin has over 30 years’ experience in senior finance & general management roles including directorship of both private & listed public companies in manufacturing, distribution and service industries. He has been involved with Fairway since 2006 serving as Treasurer and general committee member for 8 years, rejoined as Treasurer in 2017. Founding Member and Secretary of Sandringham Aged Care Association in 1992, Past President of SACA, Mayor City of Sandringham 1990/1991, Mayor City of Bayside 2013/2014 and current Mayor City of Bayside 2017/2018. B.A.(Hons.) Dip. Ed. A.L.A.A. Educator and Lecturer and Examiner. Management roles in Librarianship – Tertiary and Local Council Libraries. Anna has been a Committee of Management member for 5 years. Her mother was a Resident of Fairway. Angela is the daughter of a long term resident of Fairway. She has lived in the Bayside area for 35 years.